After having several controversial incidents with the media, Mayer withdrew from public life in 2010 and began work on a follow-up album, called Born and Raised, that would draw inspiration from the 1970s pop music of Laurel Canyon. However, the discovery of a granuloma on his vocal cords delayed the release of the album until May 2012, and ultimately forced him to cancel the planned tour. Even so, the album enjoyed a generally favorable reception, though was less commercially successful than his previous work. 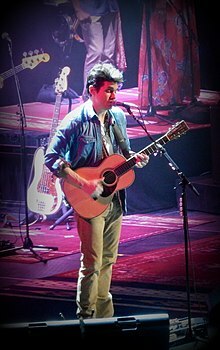 After extensive treatments for his vocal problems—and a two-year hiatus—Mayer began performing as a singer again in January 2013, and that year released the album, Paradise Valley. The album is named for where he lives in Montana and features country music influences. By 2014, he had sold a total of over 20 million albums worldwide. After developing an interest in the Grateful Dead and connecting with Bob Weir, Mayer formed Dead & Company with three former Grateful Dead musicians. After two well-received tours in the fall of 2015 and summer of 2016, the band has already committed to another tour for the summer of 2017. Mayer recounted that in 2011 he happened upon a song by the Grateful Dead while listening to Pandora, and that soon the band's music was all he would listen to. In February 2015, while guest hosting the The Late Late Show, Mayer invited Grateful Dead guitar player Bob Weir to join him in a studio performance. Weir, Mickey Hart, and Bill Kreutzmann (surviving members of the Grateful Dead) were preparing for their Fare Thee Well: Celebrating 50 Years of the Grateful Dead tour, and invited Mayer to join them; he began practicing the band's catalog of songs. That August, they formed the group Dead & Company, along with Jeff Chimenti and Oteil Burbridge, and began a fall tour in the United States. The tour was well received (Billboard called it "magical"), and they continued to tour the US into 2016. As a result of his touring with Dead and Company, Mayer postponed working on his next studio album until January 2016, with plans to finish it by the end of the year. On November 17, 2016 Mayer released "Love on the Weekend" as the lead single from his EP The Search for Everything: Wave One, which was then released on January 20, 2017. A second EP, The Search for Everything: Wave Two, was released on February 24, 2017. He plans to continue touring in 2017 as part of Dead & Company on the Dead & Company Summer Tour 2017. Mayer is an avid collector of watches, a pastime that he says keeps him "sane". His collection—which he values in the "tens of millions" of dollars—includes a Patek Philippe with a Sky Moon Tourbillion, a Rolex GMT Master 116710 BLNR, and an IWC Big Pilot Ref 5002, his signature watch. He has also served as a juror at the Grand Prix d’Horlogerie de Genève, a competition rewarding timepieces that champion the values of Swiss-made watches. He writes a column for the horology website Hodinkee. In his column for January 16, 2015, he wrote an open letter to the watch brand IWC, encouraging it to "embrace heritage, scale the product line down in terms of model variants, and simplify the design language". IWC replied, defending the changes they've made over the years, saying, "We have a wonderful past, it is true—but in admiring what we achieved thus far, we hope you will feel encouraged to look forward to what we achieve in the future". John Mayer's most iconic guitar is the "Black1." Conceived after the Heavier Things tour, Mayer went to Fender Custom Shop with the desire to build a guitar. He was inspired by guitars of famous players the likes of Rory Gallagher and Stevie Ray Vaughan. This was specifically because they lacked paint and lacquer, which normally limits a guitar's resonance. He sought out masterbuilder, John Cruz, to help devise the design. In essence, Mayer wanted an all-black version of Stevie Ray Vaughan's "First Wife" Stratocaster. The guitar is heavily relic'd to specs very similar to the guitar used by Stevie Ray Vaughan. The Black1 includes a mint pickguard, custom wound pickups, gold hardware, and gold tuners from the SRV Tribute Stratocaster. It was the principal guitar on the Continuum album. It was notably used on tracks such as "I Don't Trust Myself With Loving You," and "Bold as Love." The Black1 has become a trademark to Mayer's music. Mayer has never married, but has been romantically involved with Jennifer Love Hewitt, Jessica Simpson, Minka Kelly, Jennifer Aniston, Katy Perry, and singer Taylor Swift. ^ a b "John Mayer Talks Grateful Dead Legacy, Fare Thee Well and Learning to Play 'A Universe of Great Songs'". Billboard. Retrieved 2015-11-18. ^ a b "Dead & Company Announce Summer Tour 2017". JamBase. December 1, 2016. Retrieved February 24, 2017. ^ "Hear John Mayer's First New Song in Three Years.". www.Rollingstone.com. ^ Spillane, Sean (March 18, 2015). "Central High School - John Mayer". SchoolWebPages.com. CT Post. Retrieved February 13, 2004. ^ a b c (2005). "Men Of The Week: Entertainment-John Mayer" Archived January 18, 2008, at the Wayback Machine. Ask Men. Retrieved April 12, 2006. ^ a b (November 6, 2006) "Mon Nov 6: Telecom; Spam Attack; John Mayer". TVNZ. Retrieved December 6, 2006. ^ a b Guthrie, Blake (November 20, 2003). "Mayer of Atlanta: John Mayer plays Philips Arena, and all I got was this lousy cover story". Creative Loafing. Retrieved February 17, 2007. 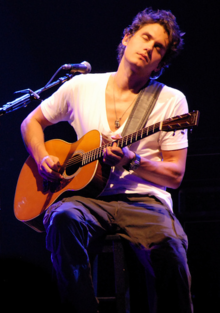 ^ Alter, Gaby (April 1, 2007) "Tour Profile: John Mayer" Archived September 4, 2014, at the Wayback Machine.. Mix. Retrieved April 23, 2007. ^ "A Brief History". Aware Records. Retrieved June 12, 2007. Archived February 7, 2007, at the Wayback Machine. ^ Back, Alan (June 15, 2001). "John Mayer carves out his own niche with national debut album". Nique. Retrieved June 22, 2007 Archived September 29, 2007, at the Wayback Machine. ^ Medsker, David (2003). "Love me, love me, say that you love me..." Pop Matters. Retrieved June 8, 2007. Archived November 12, 2006, at the Wayback Machine. ^ (2006) John Mayer. Song Writers Hall of Fame. Retrieved September 29, 2006. Archived October 1, 2006, at the Wayback Machine. ^ Bio JohnMayer.com. Retrieved June 25, 2007. Archived July 20, 2007, at the Wayback Machine. ^ Mayer, John (2006). "Continuum First Listen" JohnMayer.com. Retrieved June 8, 2007. Archived November 26, 2014, at the Wayback Machine. ^ "'The Village Sessions' Released Today". JohnMayer.com. Retrieved June 8, 2007. Archived November 10, 2014, at the Wayback Machine. ^ JohnMayer.org staff "Continuum (special edition) to be released on November 20; includes 6 live tracks and new single, Say". Retrieved November 19, 2007. Archived January 20, 2015, at the Wayback Machine. ^ "Mayercraft Carrier Cruise: February 1–4, 2008: A John Mayer/Sixthman Experience". Mayercraft.com. Archived from the original on October 11, 2007. Retrieved September 26, 2007. ^ Cashmere, Paul (August 3, 2009), "Guy Sebastian Album To Be Released In October". Undercover Music News. Retrieved August 4, 2009. ^ a b c d Doyle, Patrick (January 30, 2013), Q&A: John Mayer on His New Voice, Summer Tour and Dating Katy Perry. Rolling Stone. Retrieved March 19, 2015. ^ a b c "John Mayer on Taking a Break". Warner Bros. May 15, 2012. Retrieved June 12, 2012. ^ Browning, Skylar (May 15, 2012), "John Mayer now lives in Montana". Missoula Independent. Retrieved June 1, 2012. ^ a b Hergett, Rachel (January 16, 2013). "Welcome home". The Bozeman Daily Chronicle News. Retrieved February 18, 2013. ^ Hughes Cobb, Mark (April 26, 2013), "John Mayer starts off season at Tuscaloosa Amphitheater". Tuscaloosa News. Retrieved March 20, 2015. ^ "John Mayer grateful for his time with Dead & Company". The Sacramento Bee. Retrieved 29 July 2016. ^ Danielle Jackson (2017-01-03). "John Mayer announces release plans for new music". Ew.com. Retrieved 2017-05-02. ^ Sinclair, David (2007). "John Mayer: My Atlantic crossing" Archived December 9, 2012, at Archive.is The Belfast Telegraph. Retrieved January 28, 2007. ^ Dansby, Andrew (2004). "Mayer, Maroon 5 Hit the Road" Rolling Stone. Retrieved April 12, 2006. Archived February 12, 2007, at the Wayback Machine. ^ Dansby, Andrew (2003). "Mayer, Crows to Tour " Rolling Stone. Retrieved April 12, 2006. Archived February 12, 2007, at the Wayback Machine. ^ AP staff (June 15, 2006). "Crow, Mayer Teaming For Tour". Billboard. Retrieved May 31, 2007. ^ General Information Local 83: Listener's Union. Retrieved June 25, 2007. Archived June 11, 2007, at the Wayback Machine. ^ NME New York staff (October 15, 2007), "John Mayer plays tiny surprise show in New York". NME. Retrieved January 18, 2011. ^ (August 9, 2009), "Secret Show Tonight 8/9/09 at LA'S Troubadour!"'. JohnMayer.com. Retrieved January 18, 2011. Archived December 2, 2010, at the Wayback Machine. ^ Swartz, Kristi E., et al. (September 8, 2010), "John Mayer plays surprise Eddie's Attic show Tuesday". The Atlanta Journal-Constitution. Retrieved January 18, 2011. ^ "johnmayer.com". Archived from the original on 2008-01-02. Retrieved 2017-05-02. ^ a b c Williams, Alex (April 30, 2015), "John Mayer’s Wrist Is a Wonderland". The New York Times. Retrieved May 4, 2015. ^ "'Rollin' With Zach' and 'The Ambush Cook' This December on OWN". Oprah.com. November 11, 2011. Retrieved February 18, 2013. ^ "Fretbase, John Mayer's Signature Acoustic Guitar – the Martin OMJM (2008)". Fretbase.com. August 4, 2008. Retrieved July 24, 2011. ^ "John Mayer Signature" Two-Rock. Retrieved May 10, 2007. Archived May 2, 2007, at the Wayback Machine. ^ a b "John Mayer - Black One Story". YouTube. 2012-01-05. Retrieved 2017-05-02. ^ "Fender Custom Shop Road Show With John Cruz - John Mayer". YouTube. 2015-12-03. Retrieved 2017-05-02. ^ Laing, Rob. "Fender Custom Shop John Mayer BLACK1". MusicRadar. Retrieved 2017-05-02. ^ Mike Duffy. "Introducing the John Mayer Special Edition BLACK1 Stratocaster® Guitar | Fender Tone". Fender.com. Retrieved 2017-05-02. ^ "John Mayer Announces Split with Fender". Reverb.com. Retrieved 2017-05-02. ^ "PRS Guitars Private Stock Super Eagle". Prsguitars.com. Retrieved 2017-05-02. ^ "John Mayer: Jessica Simpson Was "Crazy" in Bed". Us Weekly. Retrieved 10 February 2017. ^ "Jennifer Aniston ended relationship with John Mayer because of his Twitter 'obsession'". The Telegraph. Retrieved 10 February 2017. ^ Nelson, Jeff. "John Mayer and Katy Perry 'Are Not Back Together,' Says Source – But 'They Will Always Care for Each Other'". People Magazine. Retrieved 10 February 2017. ^ Bryant, Kenzie (2016-12-14). "Taylor Swift's Ex John Mayer Forced to Retract Tweets Sent on Her Birt". Vanity Fair. Retrieved 2017-05-02. ^ The Official John Mayer Auction Site John Mayer Auction. Retrieved April 23, 2007. Archived January 31, 2015, at the Wayback Machine. ^ "John Mayer" Business Here. Retrieved April 23, 2007 Archived February 4, 2007, at the Wayback Machine. ^ Kilgore, Kim (2007). "More cities added to John Mayer's itinerary". Retrieved May 1, 2007. Archived February 15, 2009, at the Wayback Machine. ^ Virginia Tech (August 1, 2006).A Concert For Virginia Tech, Archived August 23, 2007, at the Wayback Machine. ^ Mayer, John (November 14, 2007). "NEW SHOW: 1ST ANNUAL HOLIDAY CHARITY REVUE ON DECEMBER 8 AT NOKIA THEATRE LA LIVE.". Johnmayer.com. Archived from the original on December 26, 2007. Retrieved December 29, 2007. ^ Guthrie, Blake (May 16, 2001), "Square pegged". Creative Loafing. Retrieved on February 2, 2010. ^ Koonse, Emma (May 16, 2012). "John Mayer 'Lost His Head' 2 Years Ago". The Christian Post. Retrieved June 12, 2012.